Topps Traded is traditionally seen as a year-end box set. 1995 Topps Traded and Rookies changed that. It marked the first time the product was released exclusively in foil packs. The design of the 165-card set maintains that of the flagship 1995 Topps Baseball set. Base cards have white borders that give way to a photo with rough edges. The player name is in gold foil at the bottom of the card. Their position and team are below that. 1995 Topps Traded and Rookies Baseball subsets include Rookie of the Year Candidates, Draft Picks, All-Stars and multi-player Prospects cards. Kicking off the set is 10 At the Break cards that highlight achievements from the first half of the 1995 season. Cards are numbered with a T to differentiate them from the flagship Topps set. The most significant card in 1995 Topps Traded and Rookies Baseball is also one of the biggest errors in the modern hobby. Getting player photos mixed up is nothing new. However, they're usually reserved for small players. The 1995 Topps Traded Carlos Beltran rookie has Juan Lebron on it. 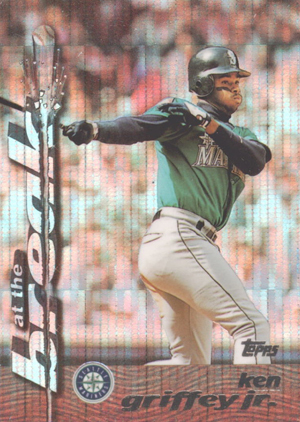 Beltran is pictured on Lebron's rookie card. This has given both cards significance. 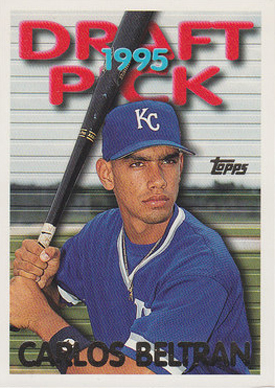 Although, it has likely also hurt the long-term prospects of the Beltran, the multi-time All-Star's lone rookie card. Other rookie cards of note in the set are Hideo Nomo, Brad Radke, Michael Barrett, Richie Sexon and Mark Sweeney. Sexson and Sweeney are paired together on a card with George Arias and Brian Schneider. 1995 Topps Traded and Rookies Baseball has just one insert set. Power Boosters are foil versions of the At the Break cards from the base set. Printed on premium card stock with a foil background, they're inserted one per 36-pack box. 10 cards. Inserted 1:36 packs.